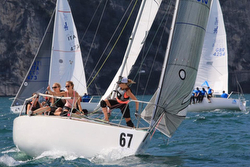 J/News Articles: Welles Crowned 40th J/24 World Champion! 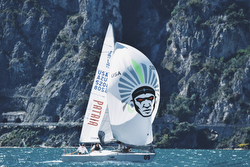 (Riva del Garda, Italy)- Lake Garda lived up to its “bucket list” reputation for the 40th edition of the J/24 World Championship in Riva del Garda, Italy. Over the five days, the eighty-nine teams from 14 countries (Australia, Brazil, Denmark, France, Great Britain, Germany, Greece, Hungary, Ireland, Italy, Japan, Netherlands, Sweden and United States) enjoyed spectacular sailing, with three days of the classic “ora” from the south and sunny; one unusual sunny, windy day of the “bora” from the north; and one day with clouds, sprinkles and no wind. Will Welles’ KASTER of the USA achieved his second J/24 World Championship in five years. With crew Nick Turney, Rich Bowen, Giuliano Cattarozzi and Andrea Casale, the Newport, RI-based helmsman recorded 47 net points in 10 races. Next best was Nobuyuki Imai’s SIESTA of Japan who ended with 68 points. Demonstrating the continued strength of the J/24 class in America, the balance of the podium and top five were dominated by three American teams. Taking the bronze was Keith Whittemore’s FURIO team from Seattle, WA (a regular on the Italian J/24 circuit); fourth place went to Travis Odenbach’s HONEY BADGER crew from Rochester, NY; and fifth was Mike Ingham’s NAUTALYTICS from Rochester, NY, who dominated Friday’s three contests with a 2-1-1. 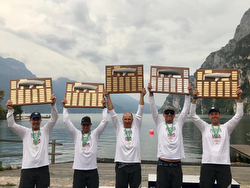 Eighty-nine teams from 14 countries (Australia, Brazil, Denmark, France, Great Britain, Germany, Greece, Hungary, Ireland, Italy, Japan, Netherlands, Sweden and United States) competed August 27-31 from Fraglia Vela Riva del Garda. For more J/24 World Championship sailing information Add to Flipboard Magazine.